Add Territory ― This setting allows the user to add territories by user. Edit Territory ― This setting allows the user to edit territories by user. Delete Territory ― This setting allows the user to delete territories by user. 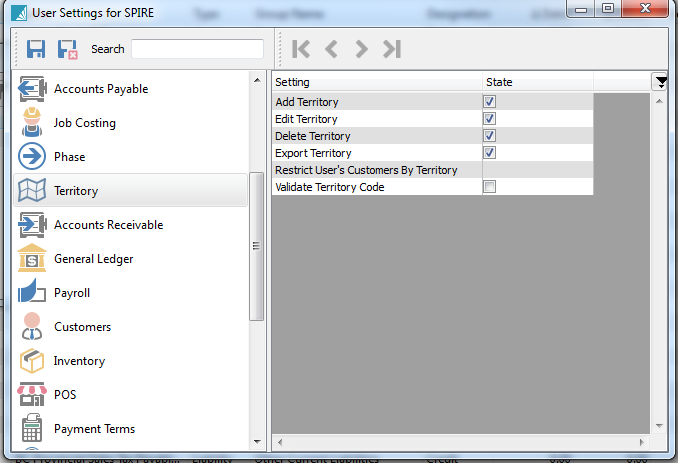 Export Territory ― This setting allows the user to export territories by user. Restrict User’s Customers By Territory ―This setting restricts the user from seeing customers, sales orders and sales history only to that territory. Validate Territory ― When set the user must only use territories that exist for customers and sales orders.